CMT’s authoritative 4th Africa Palm Oil Value Chain platform unveils latest developments in the African Palm Oil industry, aopportunities in its downstream markets and highlights the measures being put in place to help smallholders. Palm oil's popularity has skyrocketed in recent years, as its high yield makes it the most cheapest and efficient source of vegetable oil. Demand has steadily increased since the 1970s, and today the sector is already worth $50 billion a year, and projected to rise to $88 billion by 2022. Large scale production of palm oil takes place mostly in Southeast Asia. But with stiffer regulations being enforced to meet sustainability measures, Palm oil producers have turned their eyes to Africa as the next growth spot. Countries like Nigeria, Ghana and Cote D’Ivoire are the current leaders in African oil palm production, but as output is just a fraction of that of Asia, the region has tremendous potential for growth. 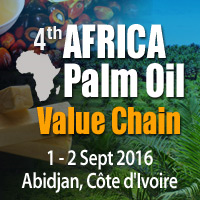 CMT’s authoritative 4th Africa Palm Oil Value Chain platform will reveal the latest developments in the African Palm Oil industry, and the opportunities in its downstream markets. It also highlights the measures being put in place to help smallholders improve competitiveness, while balancing growth and sustainability. The AIPH (Inter-professional Association of Oil-Palm Industry) will deliver the keynote address on its vital role in the Economic Community of West African States (ECOWAS) and the challenges faced in this sub-region. Large scale palm oil production operations in West Africa. Enabling access to good quality cooking oil and margarine for all Africans, with new, world-class refineries. Issues faced by smallholders, such as market instability, and the steps that can be taken to increase their productivity, such as high yield seeds, development schemes and software tools. The role of R&D in sustainable plantations development and how to produce organic, fair trade palm oil in Africa. Financing agriculture development in Cameroon. The challenges in implementing a zero deforestation policy within the supply chain. Irrigation and water use efficiency in Africa. The fauna of oil palm pollinating insects and fruit-set rates in the Côte d’Ivoire. Enhancing the value chain with downstream producers such as soap production, as well as how to leverage networks and create feedback loops. Contact hafizah(at)cmtsp(dot)com.sg or visit event website for more information.